Happy Monday everyone, it’s time to spice things up a little and introduce you guys to one of my favorite recipes: Chickpea Peanut Butter Rice! I hope you all had a wonderful weekend. I am very tired and I have a cold. I’ve been fighting it for over a week now but today it finally hit me. I had to go to work though since we had so much to finish today. If I am not better tomorrow I will take the day off sick. Since I am horribly tired I feel like this might happen anyway. Maybe a few hours of sleep will help me getting better. I am sipping gallons of tea and hope the day will pass quickly! I fear I even have to ditch soccer practice tonight! NOT COOL! I was so looking forward to it. 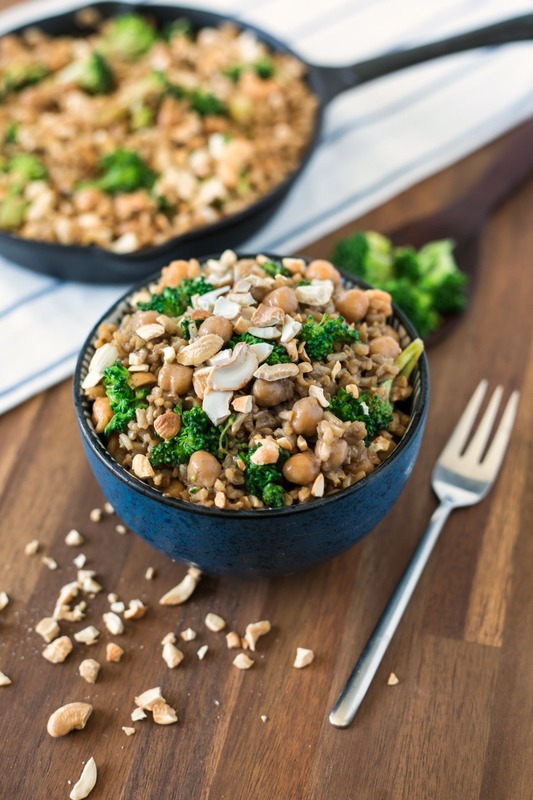 Since it’s Monday and I like to start my week with a clean eat I thought I’ll share this wonderful staple recipe of Chickpea Peanut Butter Rice today! 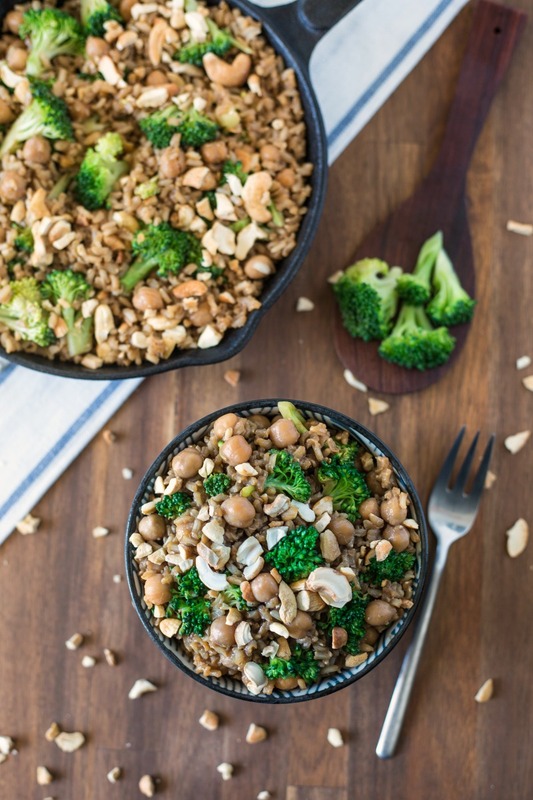 This vegan Chickpea and Peanut Butter Rice is the ideal recipe if you want a filling and flavorful carb heavy lunch. Ideal to fuel for an evening workout or long run! Plus, it's delicious and healthy! Winning! Boil the rice but use a little more water than necessary. When the rice is done there should be a little water left in the pot. Add the peanut butter and stir well. Clean the broccoli, cut it into pieces and roast a little in a frying pan. Add ginger and soy sauce. Remove your pan from the oven and add the chick peas and the rice. Season with salt and pepper. At last add the cashews and stir well. This dish tastes the best when you prepare it in the evening and take it for lunch the next day. It’s so absolutely delicious! Somestimes I cook it three days in a row. So addicting! This work week will be quite demanding since I have to finish a questionnaire for my research which will be released next Monday – but no pressure at all! The good thing is: If I manage to work focused for all in all three days I should be able to cope.